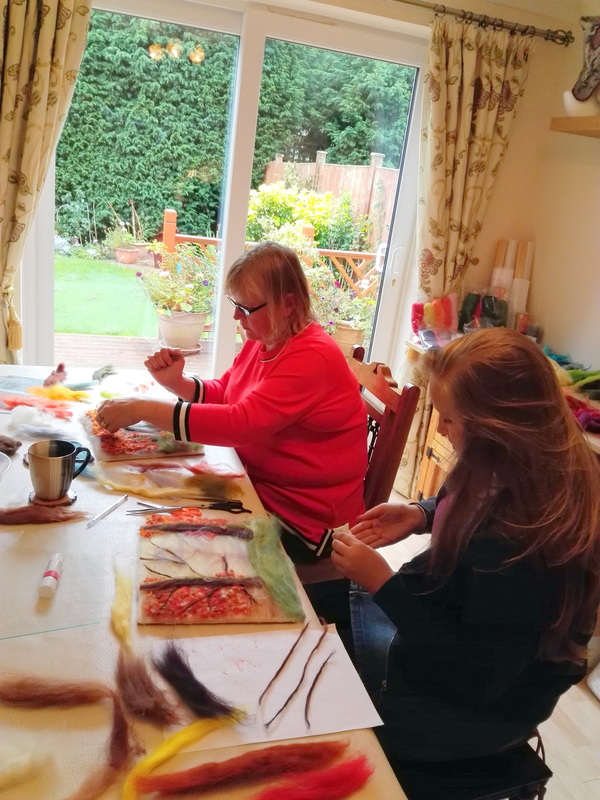 News from The Magic Wool Felt Making and Wool Painting Art and Craft Studio in Worcestershire. 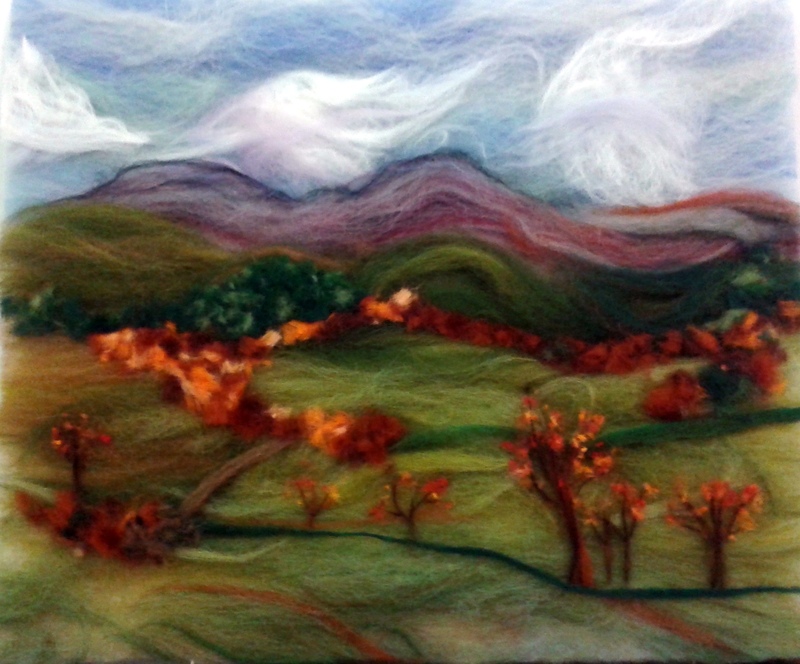 Wool Painting workshop at Westhope College, Shropshire Sunday 9th of September 10am-4pm. 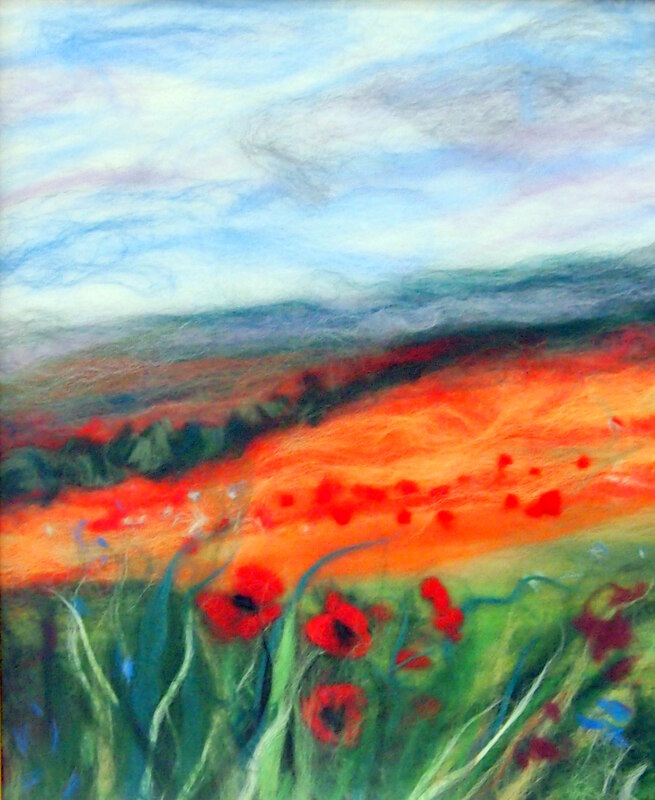 Felting workshops at Heathfield Knoll School, Thursday 3rd of May, Friday 4th of May, 7th June ,14th June and 21st June. 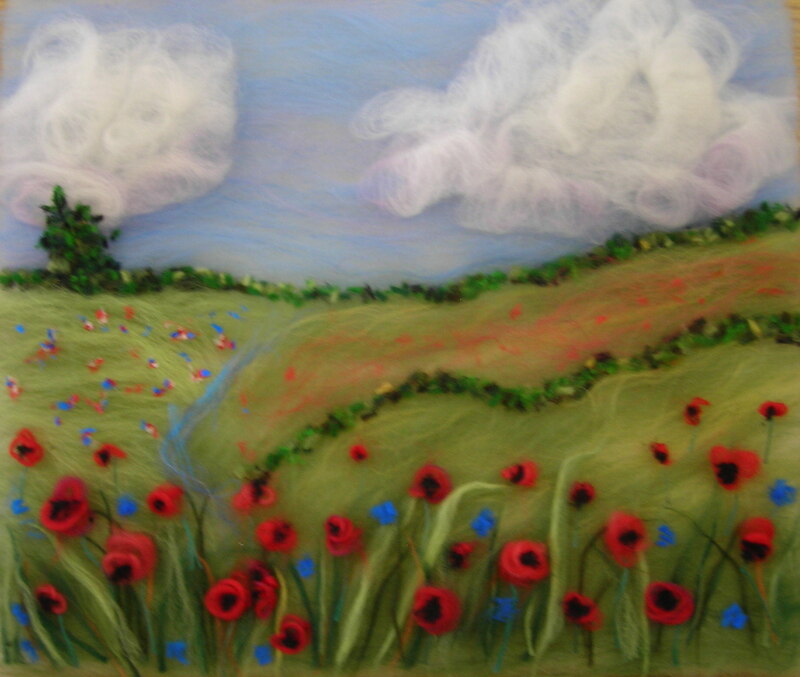 ‘Landscape with Poppy Fields’ wool painting workshop Thursday 8th March Barston, West Midlands. Bratislava trip to The British International School in Slovakia was great! I loved working with Year 6 , Year 10 and 11 pupils! We are so pleased that BBC Midlands visited Magic Wool Studio last week and celebrated our achievement in the short film ‘Arts and Crafts teacher in Kidderminster with an alternative technique’. Raya Brown is an arts and crafts teacher in Kidderminster with an alternative technique. 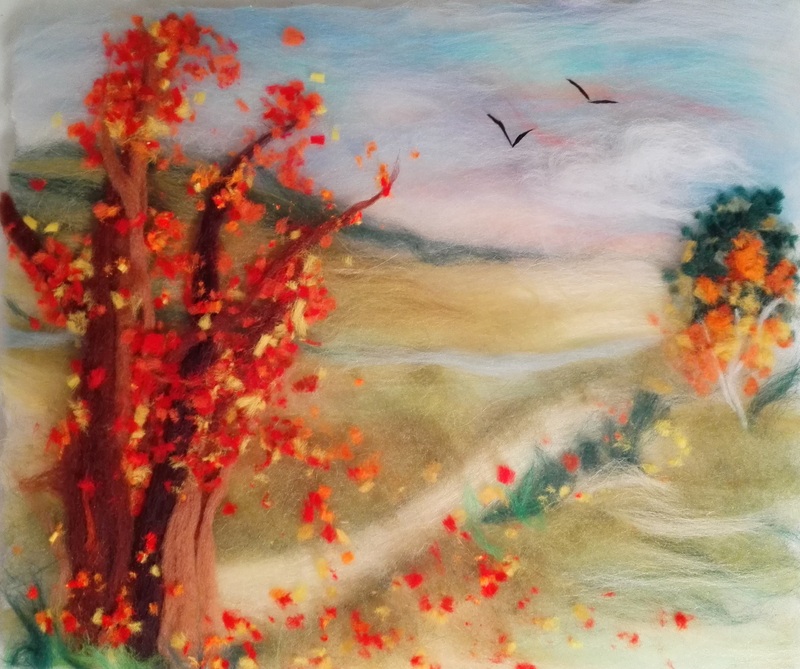 Raya uses wool to recreate her water colour paintings and has recently won an award for her craft courses. Video by Olivia Portas and Paul Jones. 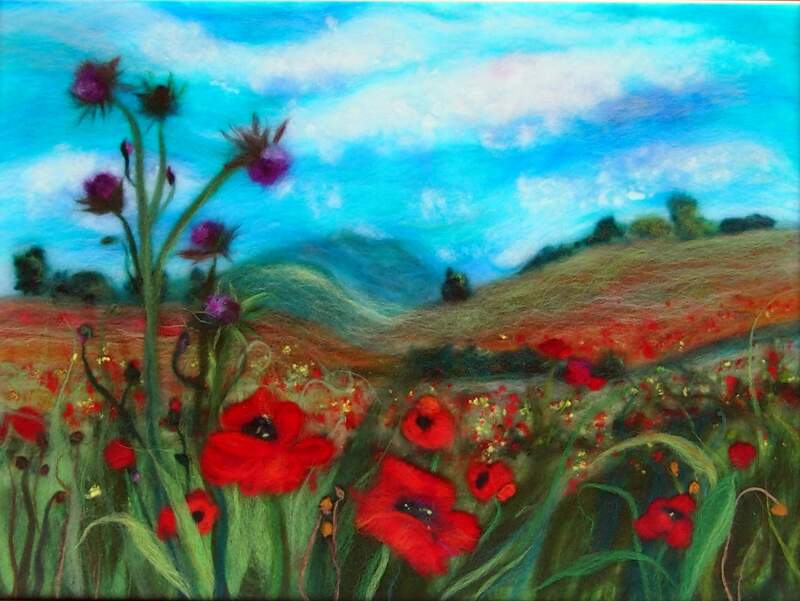 ‘Landscape’ wool painting workshop Saturday 20th January with Sutton Coldfield Creative Stitchers. We had a great workshop with lovely students from Sutton Coldfield. What a fantastic day I had with the lovely ladies from Cotswold EG. 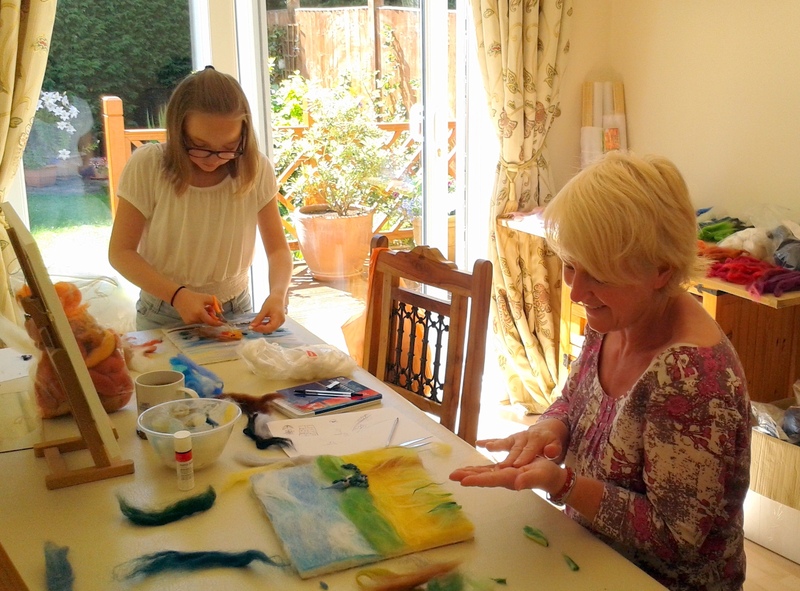 I loved teaching this creative inspirational group of people who where experimenting with fibres and different art styles. We had paintings in Impressionism style, some pictures were inspired by Van Gogh and Munch. There was such a variety of ideas and work! The workshop was very well received and some good comments were written about it. Thank you so much for your hospitality and great comments. I am so pleased. Thank you so much to all my students for your support. 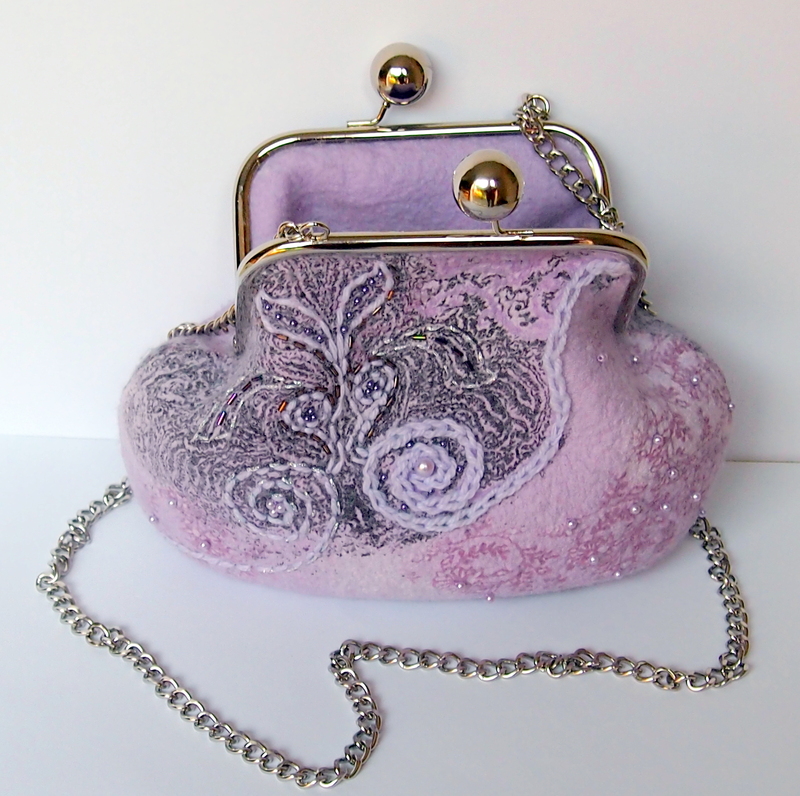 “Nuno Felted Handbag” workshop Saturday 11th November 2017. 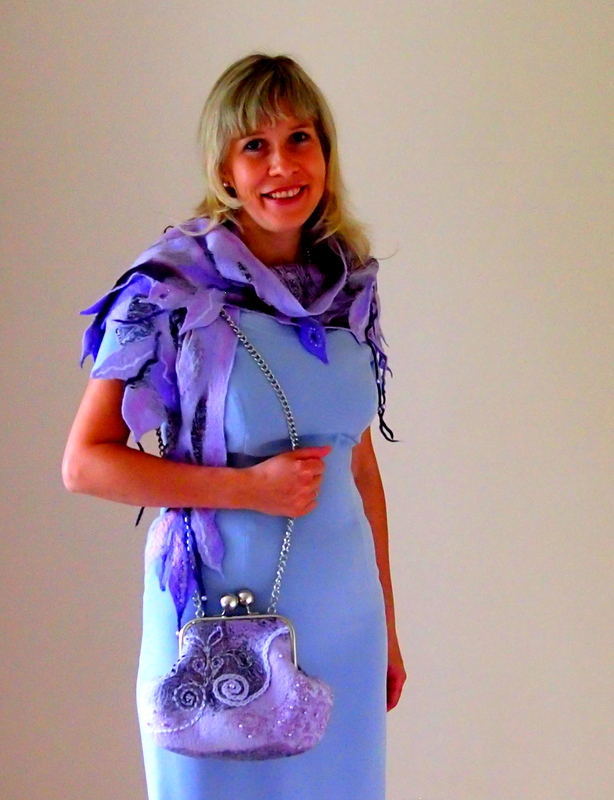 Make an amazing bespoke handbag for yourself to impress! Come around to Magic Wool Studio , design and make a unique handbag to match your outfit. 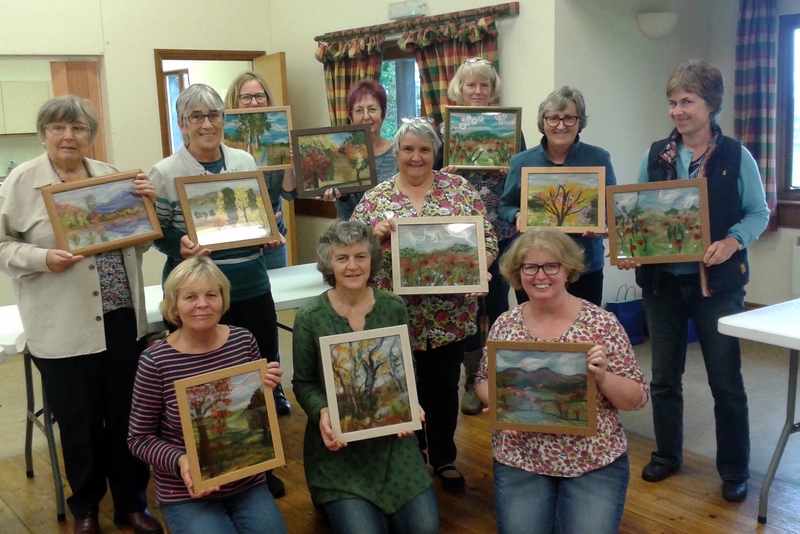 ‘Autumn Landscape’ wool painting workshop at Norton Canon Village Hall Saturday 30th September.We had an inspirational day at Norton Canon with these lovely ladies. Surrounded by gorgeous landscapes the students produced some amazing work. They told me they were not artists!! The results are stunning! Such brave use of colour and some movement in their work. 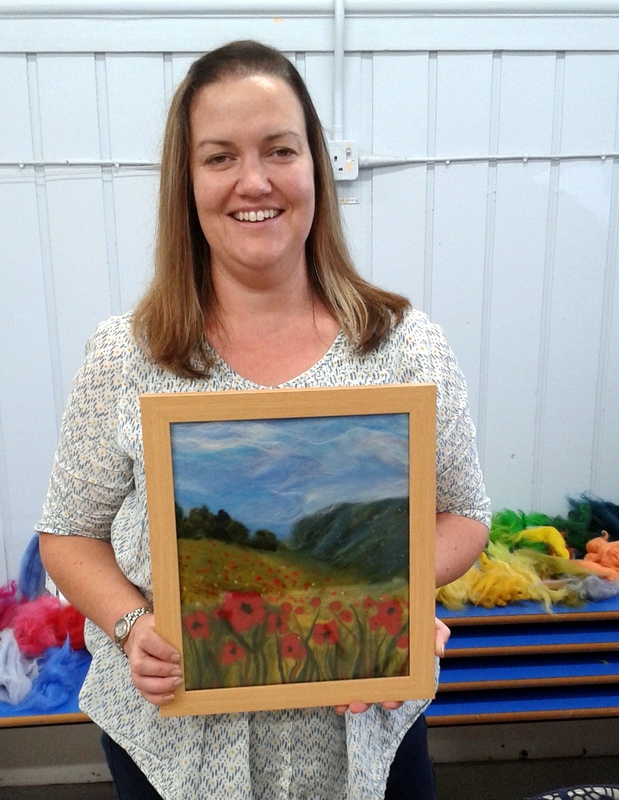 ‘Landscape with Poppy Fields’ wool painting workshop at East Midlands Region of Embroiderers’ Guild Sunday 17th September was very enjoyable experience for many students who created their own impressions of poppy field scenes. 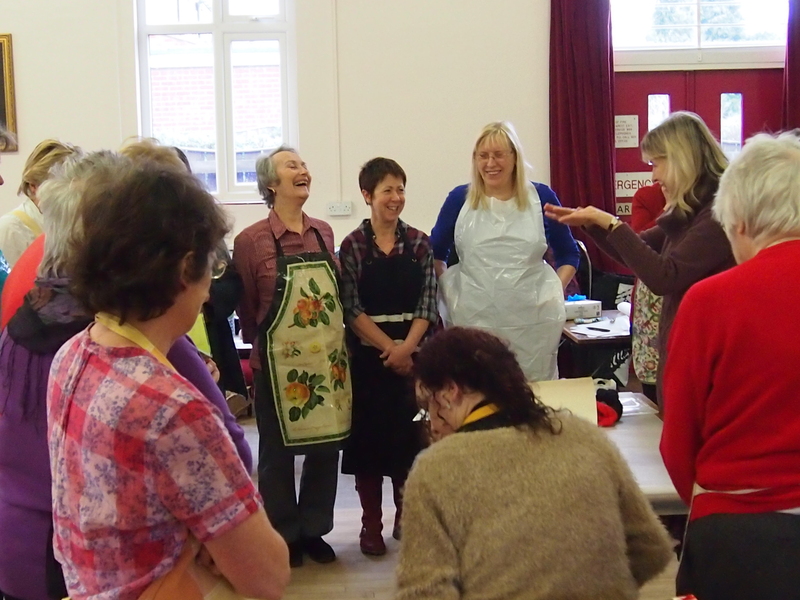 The ladies described the workshop as ‘relaxing and inspiring’. 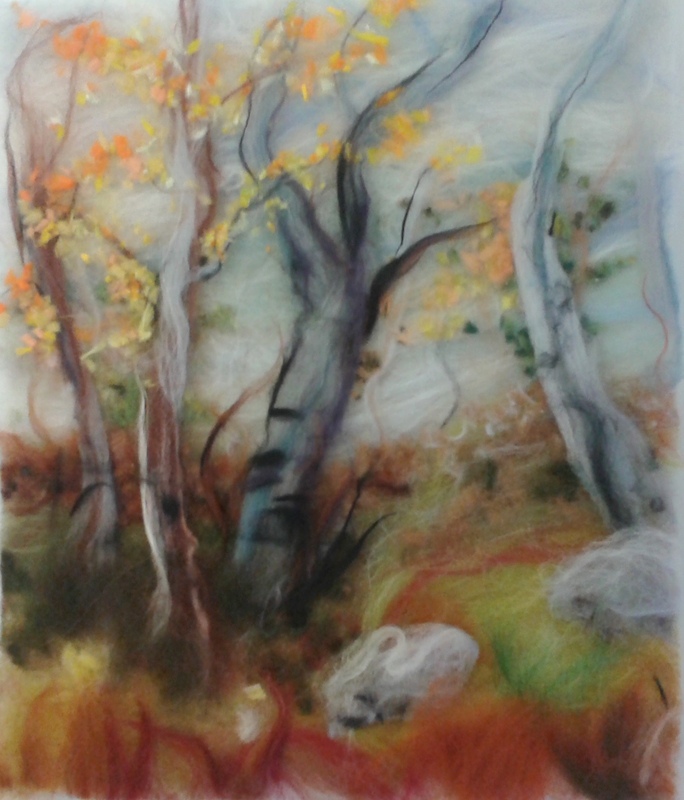 ‘Autumn Landscape’ wool painting workshop on 10th September. 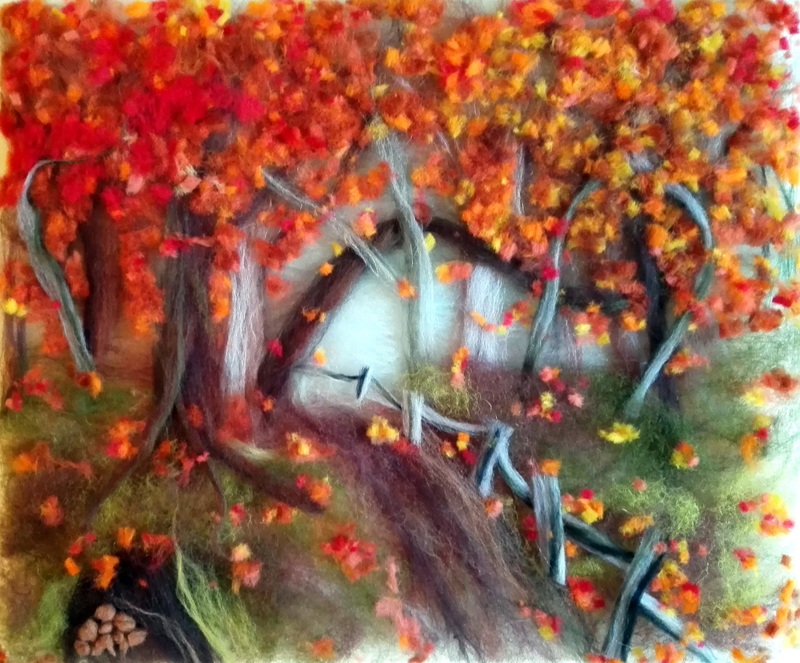 Inspired by the Autumn spirit and colours we had a fantastic workshop at Magic Wool Studio. 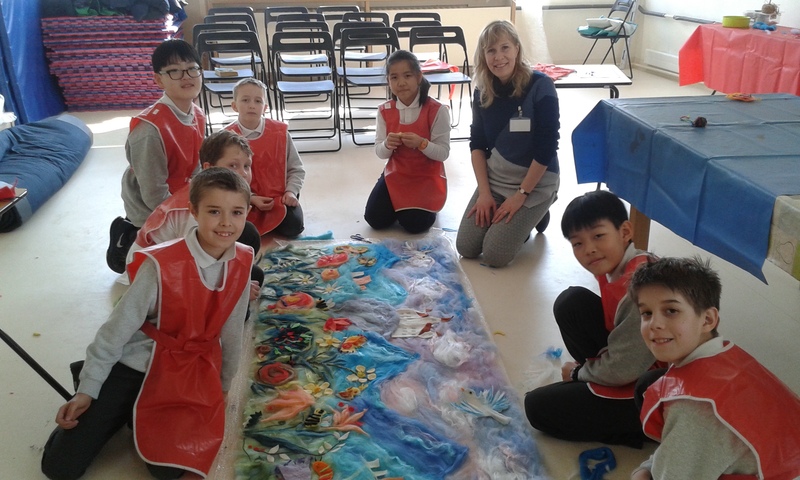 The students really enjoyed creating lovely vibrant colours blending the fibres together. They produced some brilliant pictures. Well done ladies! 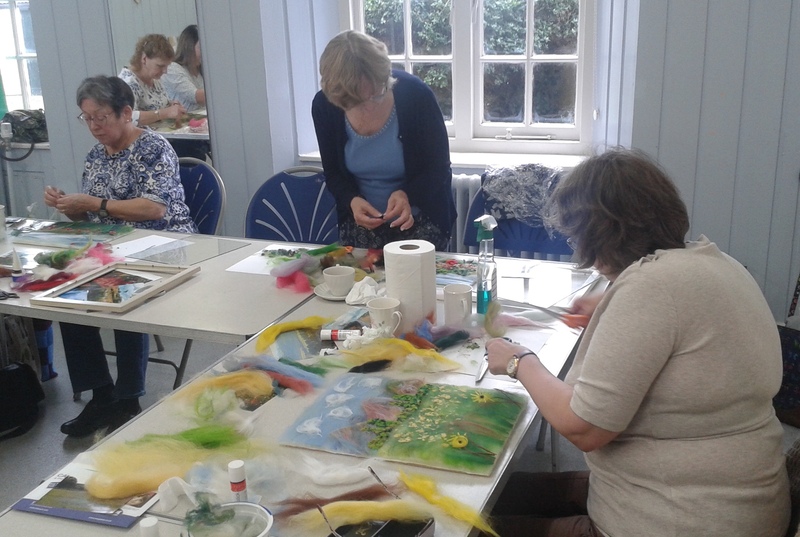 Wool painting workshop on 2nd July was a great success! 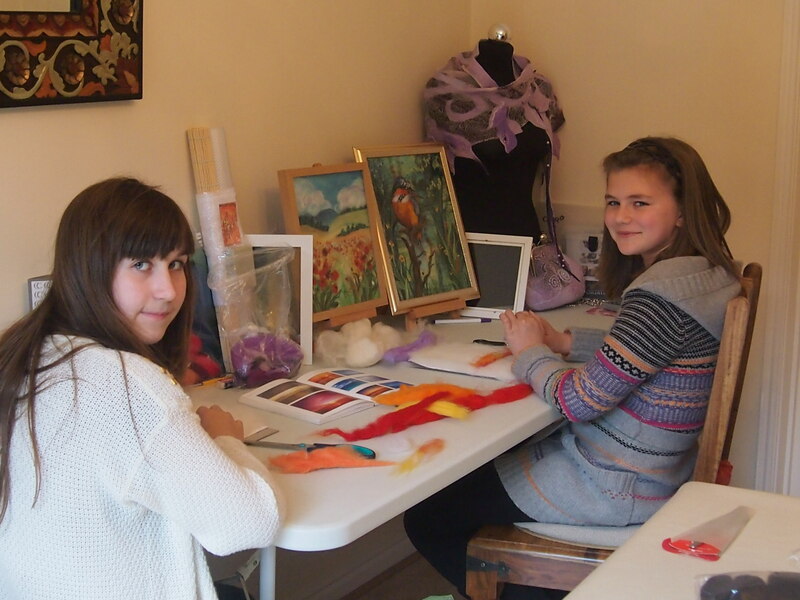 The students enjoyed learning a new technique and exploring various fibres and textures. They created some lovely wool paintings. Karen has worked from her photo of a romantic landscape of Lake District. 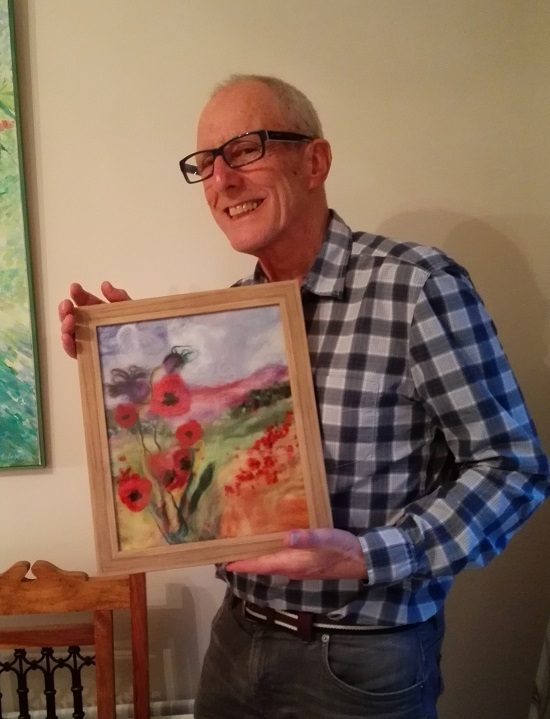 Beth loves poppies that became a main feature in her work and Eli created a wool painting with a robin for her grandad who is a very keen robin watcher. 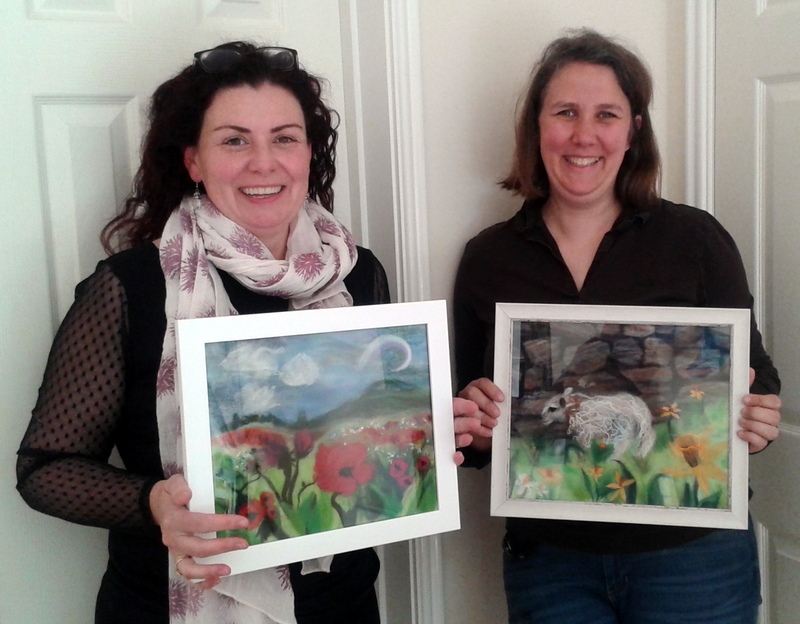 The students produced some lovely work at “Create your own wool painting” course. Kate has created a spring landscape with a lamb while Leila and her mother love winter scenes and made these lovely winter landscapes. Well done ladies! Great results! You have learnt so much! “My Creative Journey” talk at Sutton Coldfield Creative Stitchers Group 2nd February 2017. 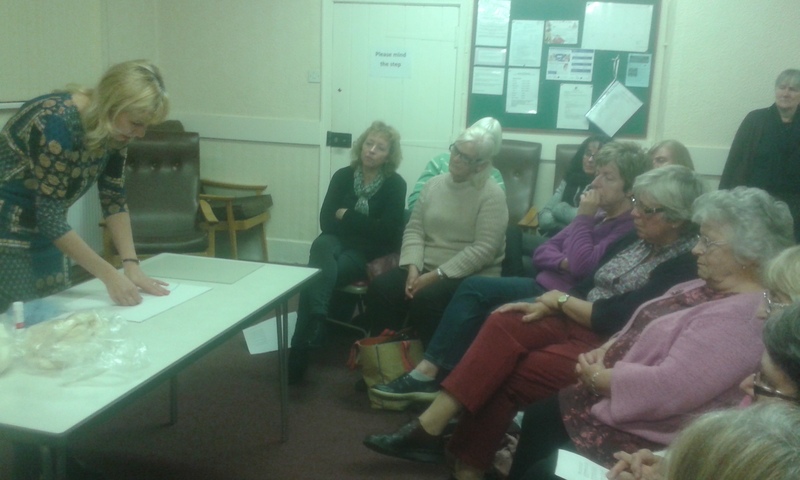 The talk at Sutton Coldfield was received really well. I am so pleased that the lovely ladies from the group enjoyed it. I got so many positive comments about my talk and work. This is what Marian wrote about my talk: “Raya delivered an articulate, passionate and enthusiastic presentation which greatly impressed her audience. Your words give me the inspiration to continue doing what I love doing. 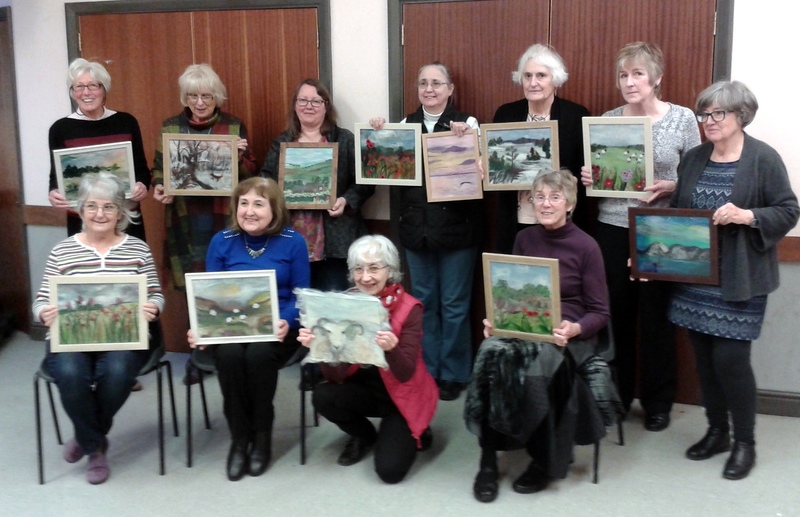 Fantastic creative Wool painting class with John and Jenny last Sunday. I really enjoyed teaching these talented people. It was a workshop of sharing ideas and exploring fibers in the most creative way. Great outcomes! This is what John commented about the workshop: “A thoroughly absorbing workshop. I had never worked with wool before and I had not appreciated what a flexible medium it is. Using fibres in a creative landscape and blending the colours was both both exciting and refreshing with an amazing and colourful outcome. Raya’s patience and skill in demonstrating and teaching was much appreciated.” Thank you, John. These are some photos from that wool painting class. What a fantastic evening at Wombourne! 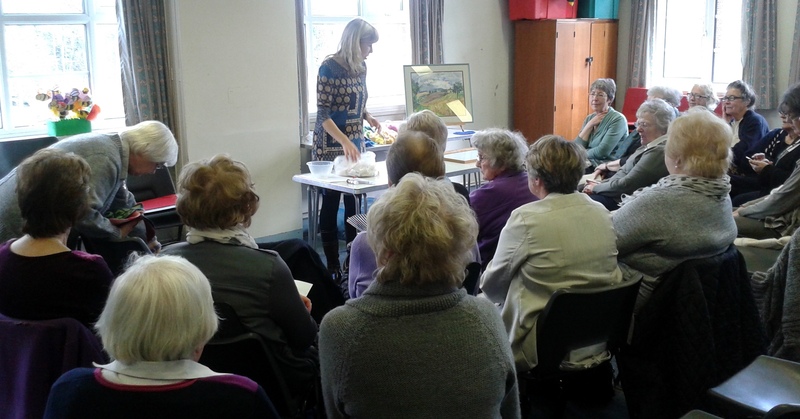 I gave a talk and did a wool painting demonstration for Wombourne Quilters this week! The ladies learnt a lot about felt making techniques and had a chance to see various samples of felt. They also looked at a small exhibition of my wool paintings and felt clothes and accessories. I received a warm welcome and it was a great pleasure to meet such enthusiastic and creative people. Thank you so much ladies! I hope to see you in January. 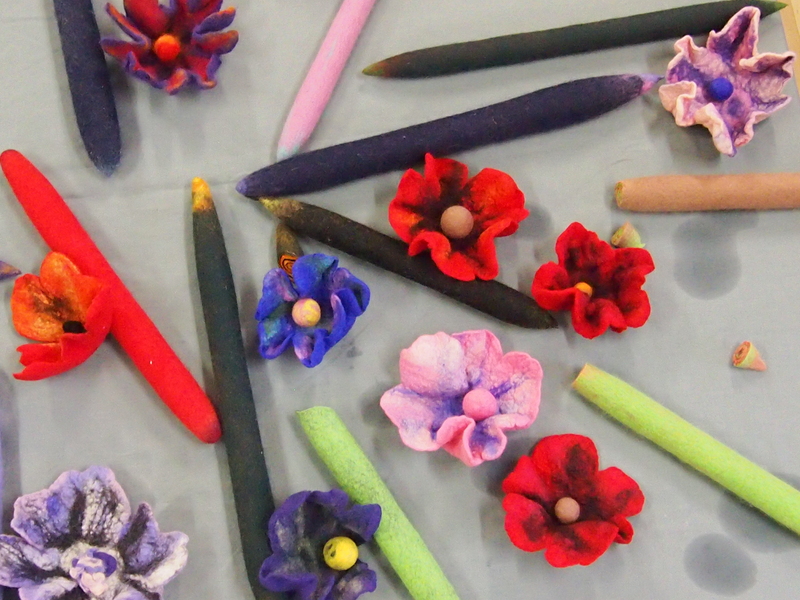 The students really enjoyed the flower making workshop at the library. They learnt wet felting technique and explored qualities of wool fibres. 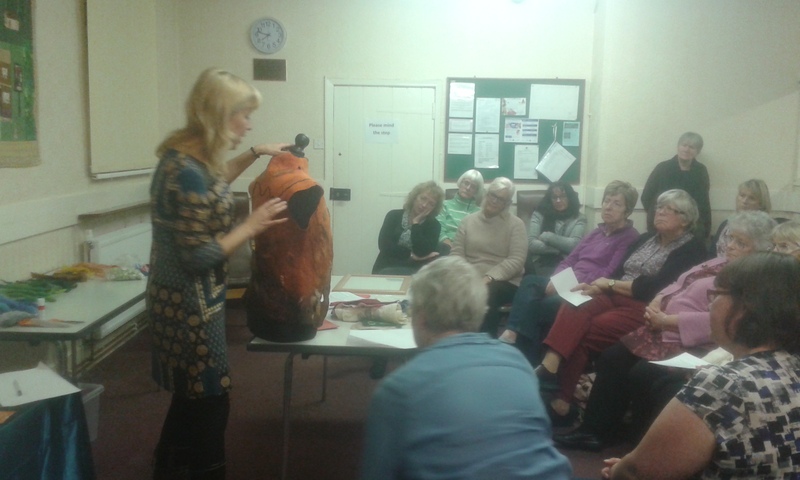 They all commented how relaxed and therapeutic the felt making process was. 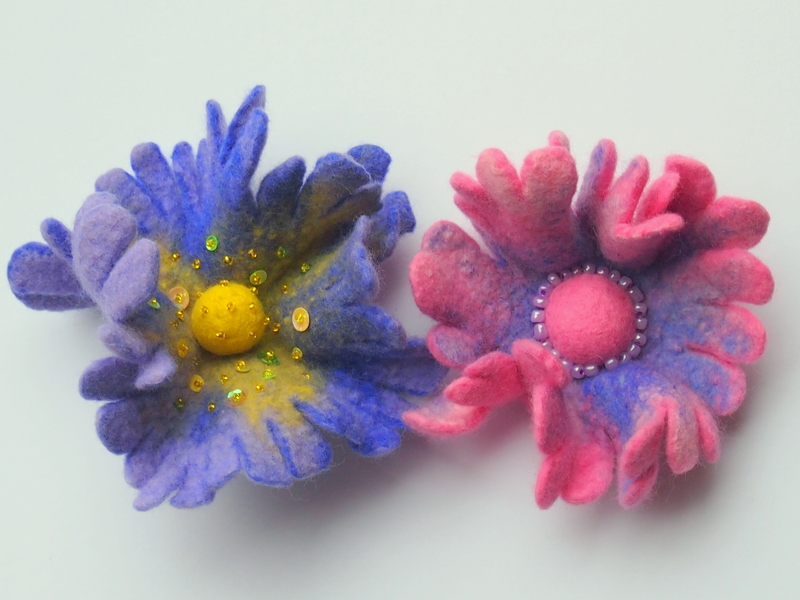 They made lovely flower brooches. I had a great time at Solihull on Tuesday 5th of April. 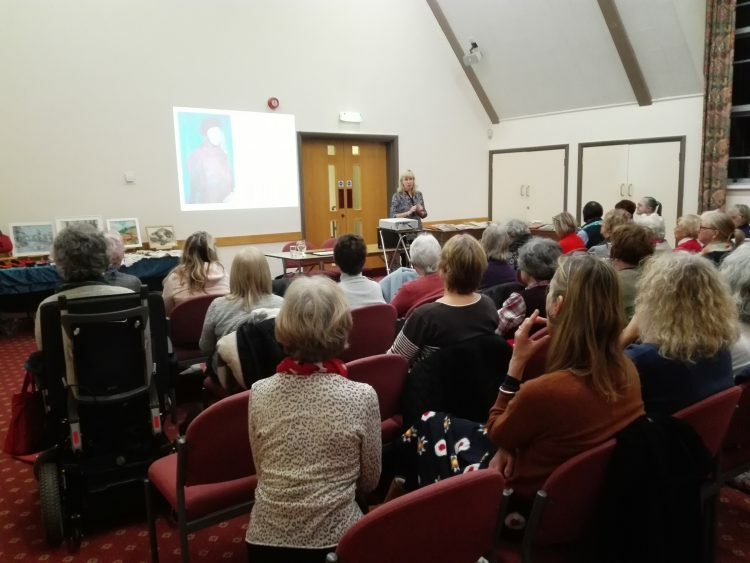 I met so many creative ladies from Solihull Embroiderers’ Guild who came to listen to my talk about wool and watch a demonstration on Wool Painting. I received such warm welcome and it was a pleasure sharing my techniques and ideas with lovely enthusiastic ladies. Thank you very much. Magic Wool Studio will take part at Fashion and Embroidery Show at NEC Birmingham this year. 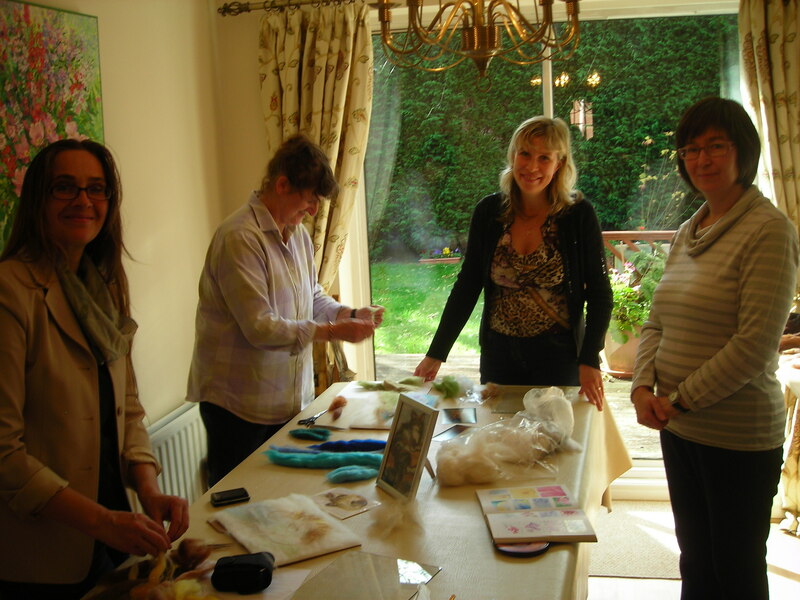 We will exhibit our range of products and advertise felt making and wool painting workshops. We will display at Stand No ZN15. 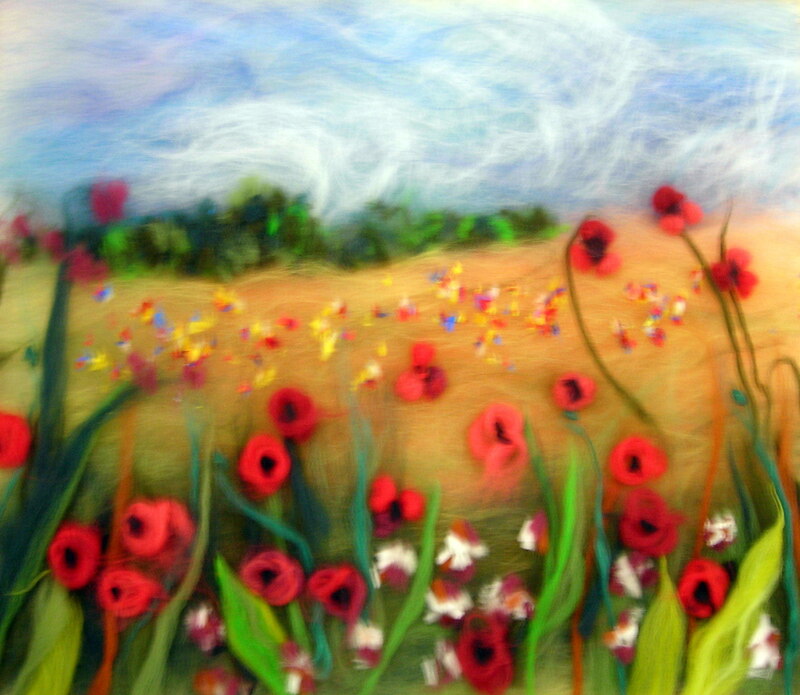 “Poppy Fields” wool painting workshop was a great success. 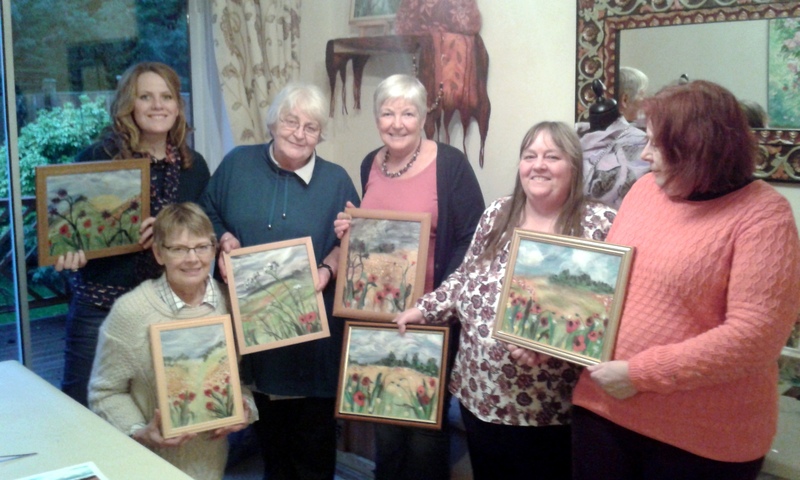 Sarah, Janet, Mo, Jenny , Anne an Irene are absolute beginners in wool painting. 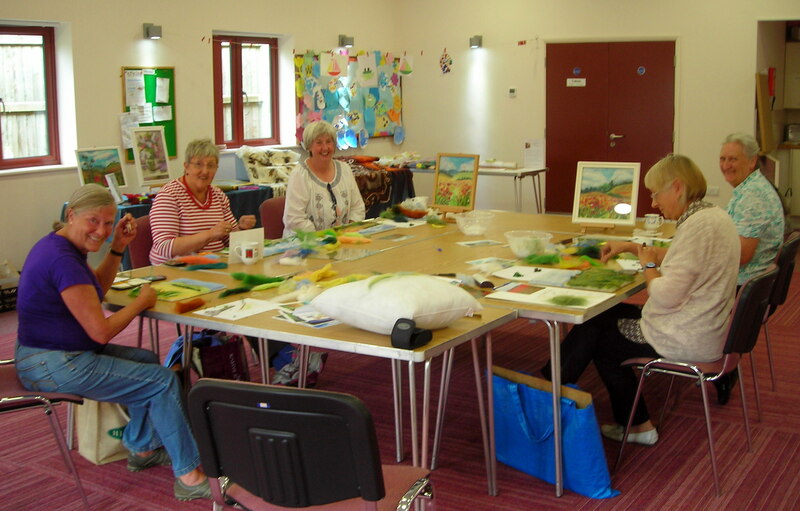 They came to the wool painting class last Sunday and learnt lots of techniques and new ways of using fibres . At the end of the class each of them produced a fantastic fibre picture which was ready to go on display . 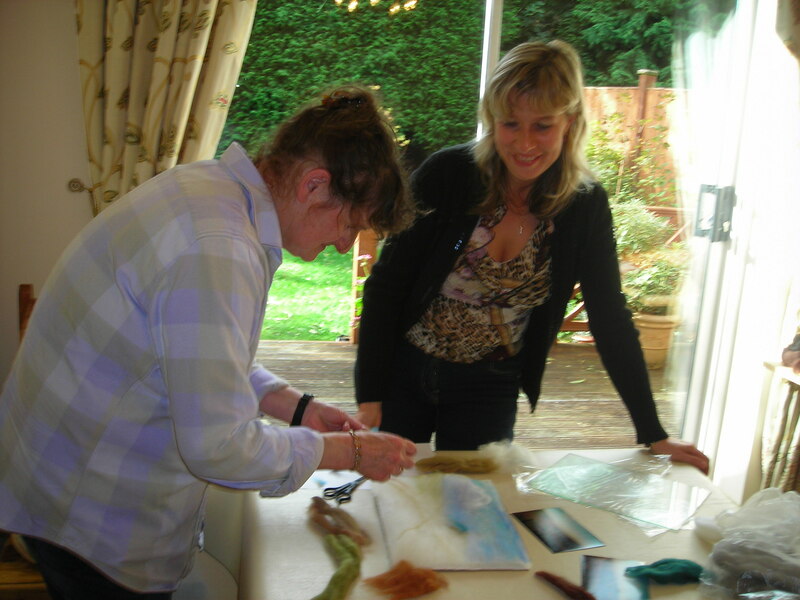 Mo commented on the workshop ” Really enjoyed the day learning a new craft. Lovely group in a very supportive, creative and comfortable environment. Brilliant day. Thank you”. 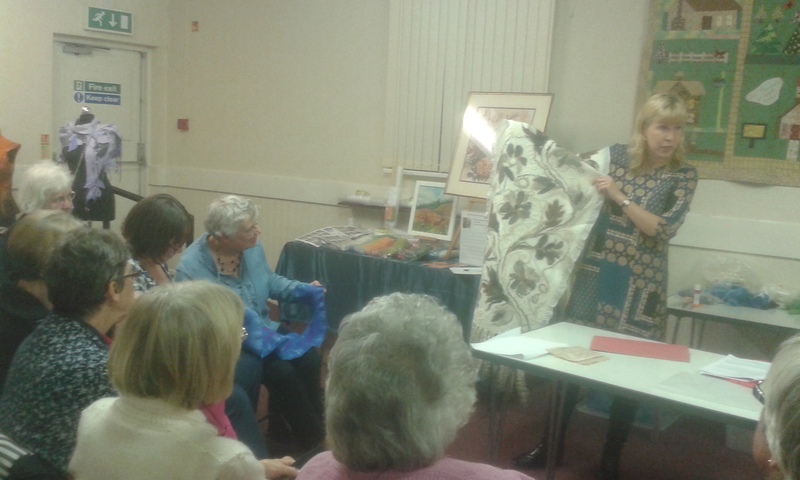 10 week course at the Carpet Museum in Kidderminster was a great success! The ladies were so inspirational and creative! They have learnt a lot and made some fantastic felted items. 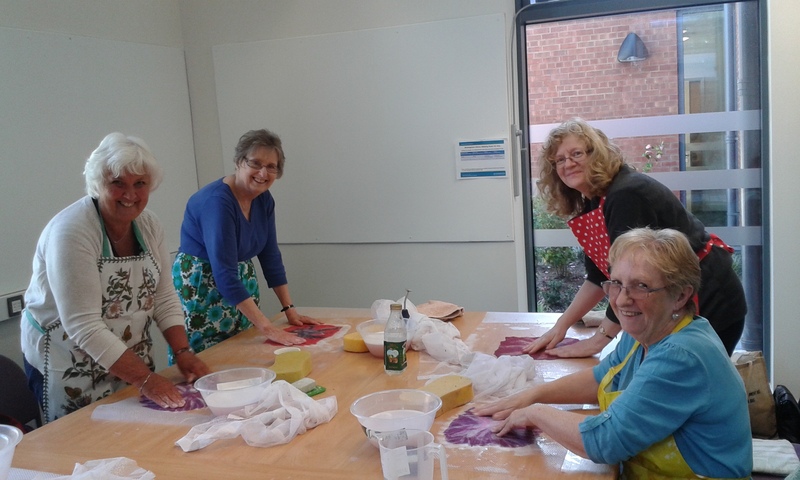 We are hoping to continue running felt making courses at the museum. Thanks very much to all the museum staff for their support. 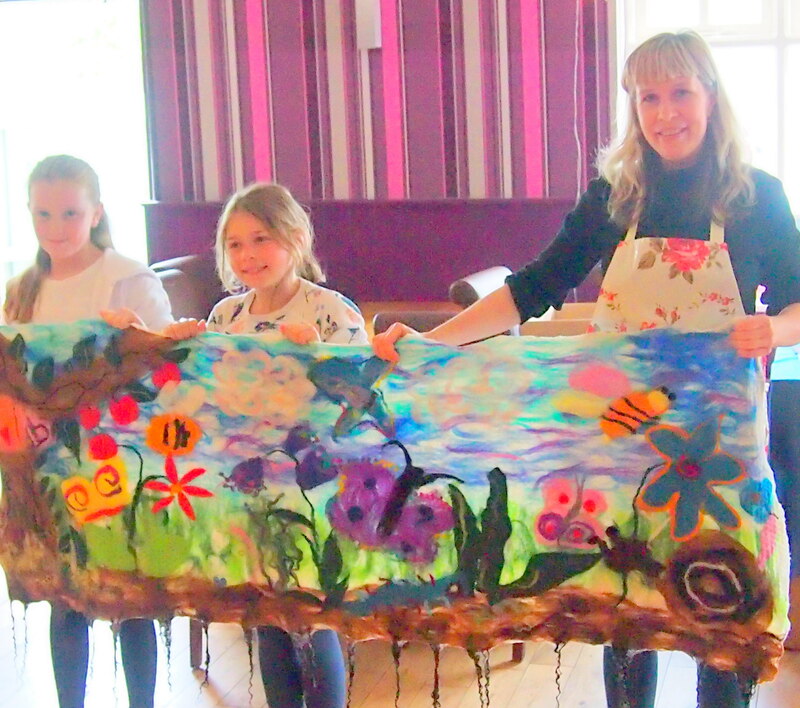 Half term Felt Fun activity for children at Kidderminster Carpet Museum. 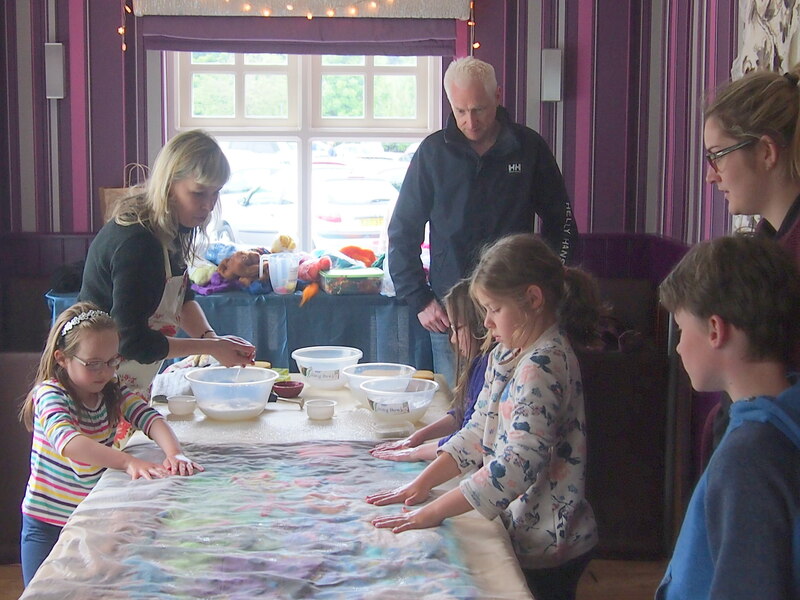 We had good fun working with children and members of staff at Kidderminster Carpet Museum during half term. 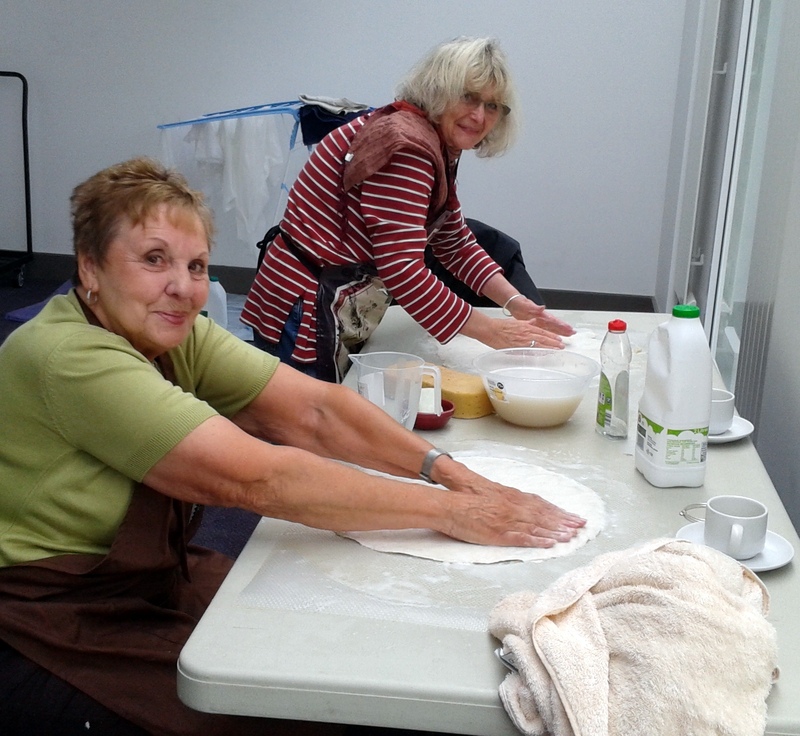 We were working on a big felted banner which will be displayed in Kidderminster Town center. The banner is based on carpet designs which were used by Woodward Grosvenor carpet factory in 1950s. We used an Indian Elephant motif and created some patterns to decorate this banner. We were also inspired by the lovely autumn colours which we are seeing this season. The banner will be finished soon. ( It is still drying) I would like to say a special “Thank you” to Gill and Sarah who helped us so much ! 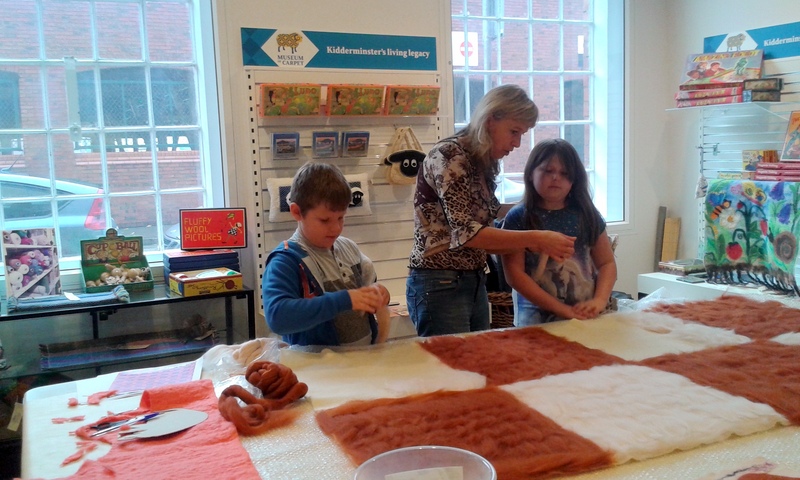 Following the successful Felt Making Course in the summer we are continuing teaching felt making at Kidderminster carpet museum. 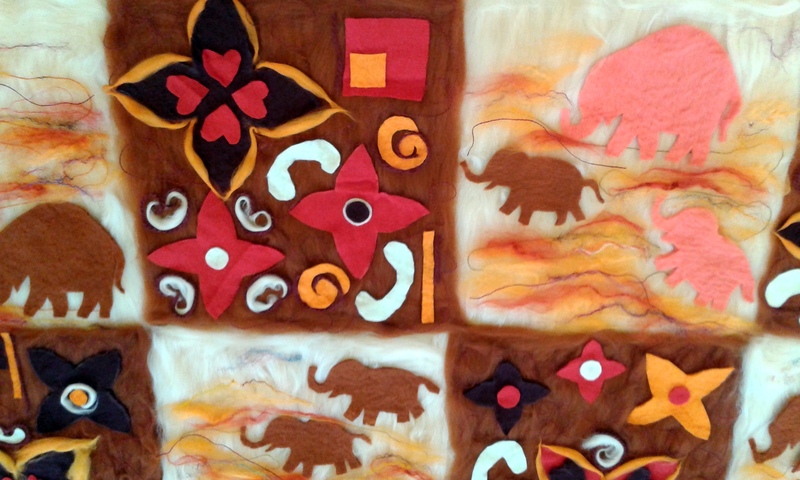 Join us to explore the ancient method of felt making with a professional Artist and Felt Maker Raya Brown. Enjoy the unique tactile and therapeutic experience working with natural fibres such as wool, silk, etc. Learn wet felting and needle felting technique. 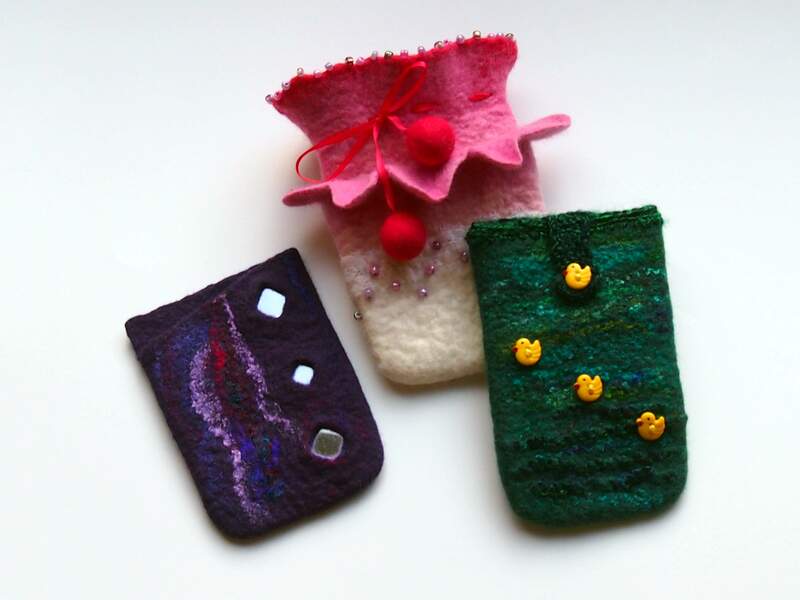 Design and make beautiful felted gifts- Felted Mobile Phone case, Felt bracelet, Nuno felted purse/make-up bag and a Table Runner. 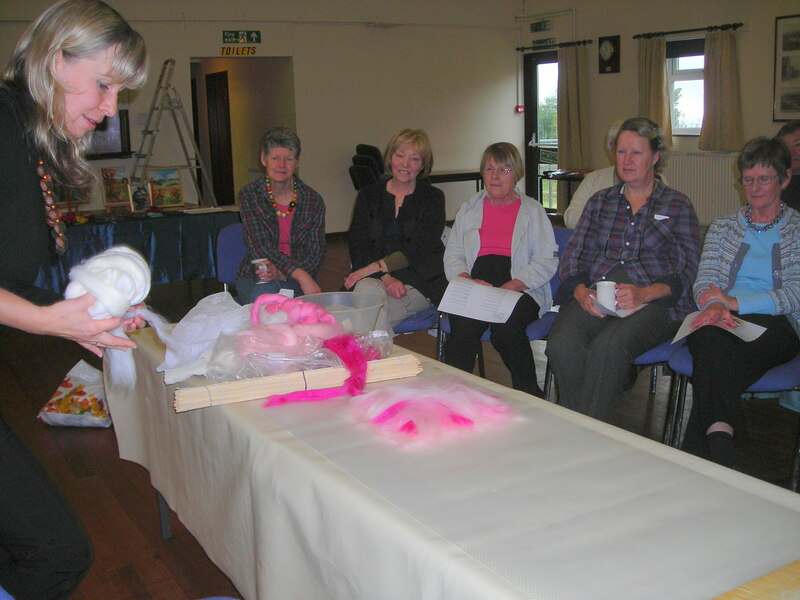 What a fantastic workshop I had with Lingen Stitchers in July! 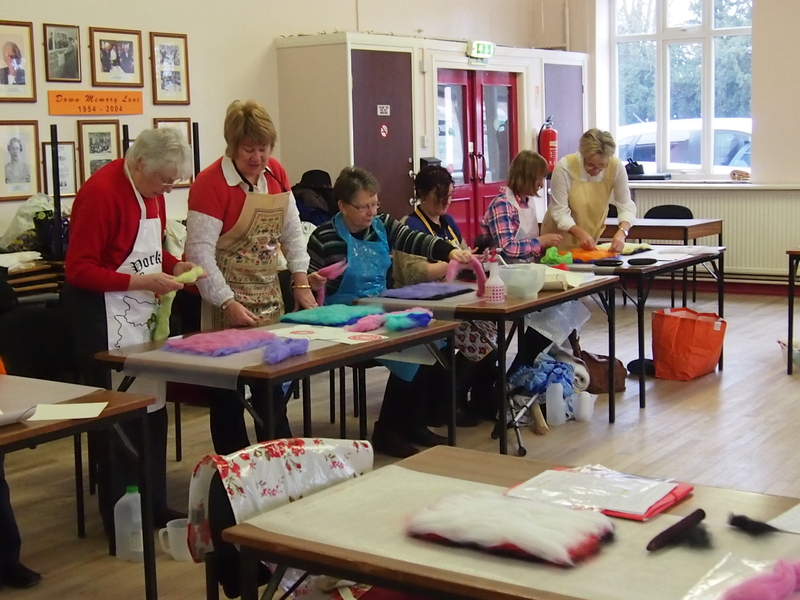 I would like to say a great “Thank you” to all the ladies from Lingen Stitchers group in Herefordshire. What a lovely group of friendly and enthusiastic people! My workshop was well received; the students were very helpful and keen to learn the new techniques.They nearly missed their lunch! 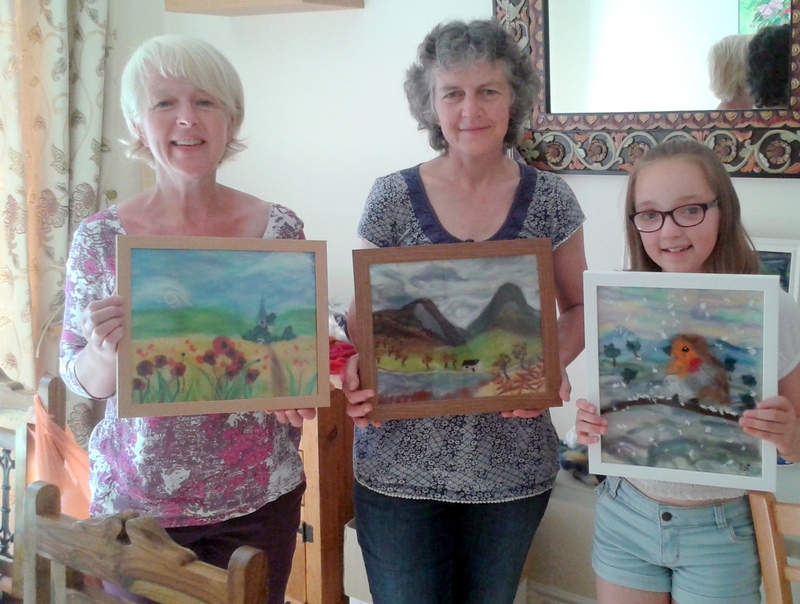 They produced some lovely wool paintings which will be displayed at the Lingen exhibition in August. 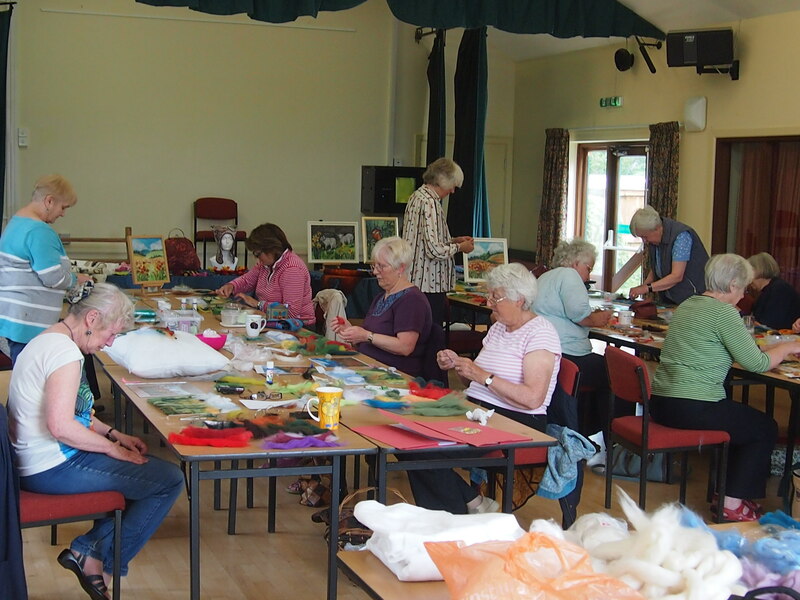 Wool Painting workshop and talk at Stratford-upon-Avon Guild of Weavers,Spinners and Dyers. 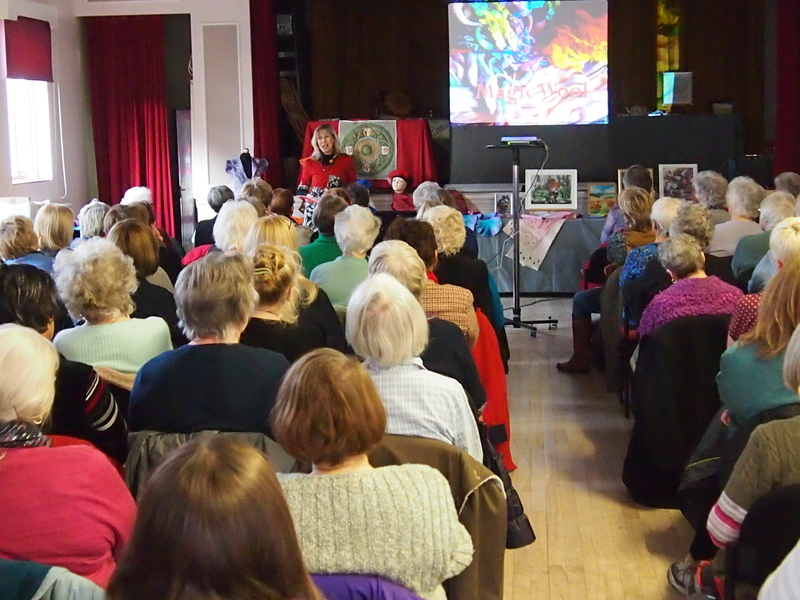 I had a fantastic weekend with the ladies from Stratford-upon-Avon Guild of Weavers,Spinners and Dyers. On Friday 19th of June I delivered a talk called ” My creative journey” at the Methodist Church Hall. 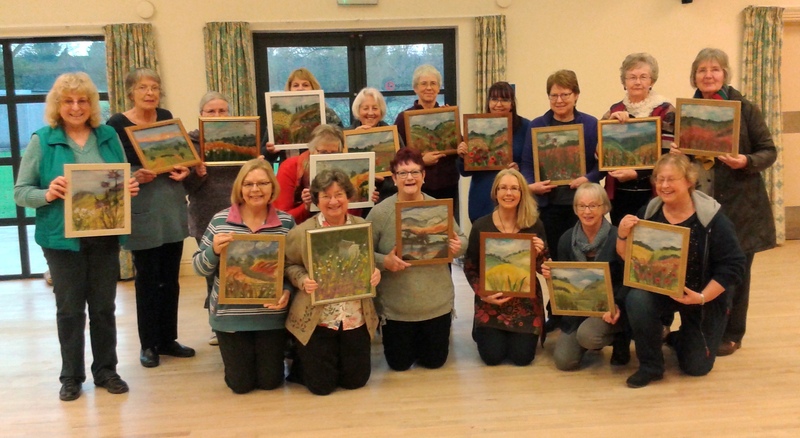 The following Saturday I taught a wool painting workshop at the same venue! What a great location, right opposite the famous Holy Trinity Church! My talk and the workshop were very well received and I had such a pleasure working with lovely group of enthusiastic and very helpful people. The members of the guild had a chance to look at some of my original work and ask me specific questions about some techniques and materials that I use. 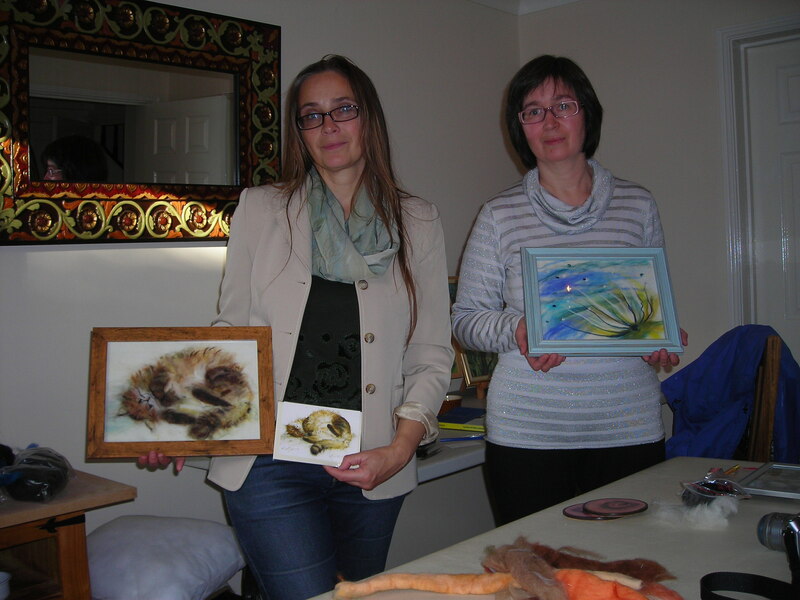 Here I display some photos of the wool paintings that the ladies created. I am amazed at how different they are. Each picture shows a specific mood and different effects of shade and light . The pictures also demonstrate deep personal connection to the subject. Artist and Felt maker from Worcestershire Raya Brown and the children who took part in creating a wall hanging for the New Hope . 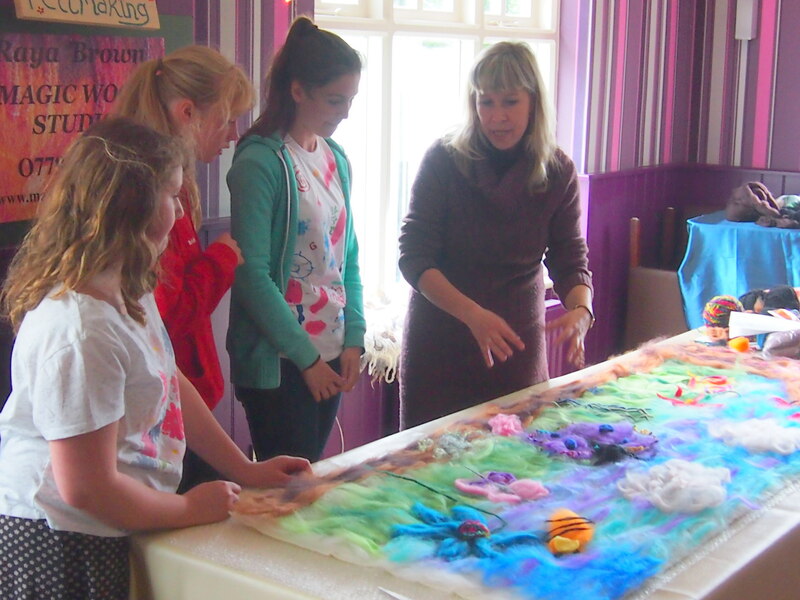 “The children really loved working on felted wall hanging at Severn Sounds Family Festival in Worcester on May 31st 2015. We had a so many enthusiastic and creative children who helped us make a wall hanging for The New Hope in Worcester. 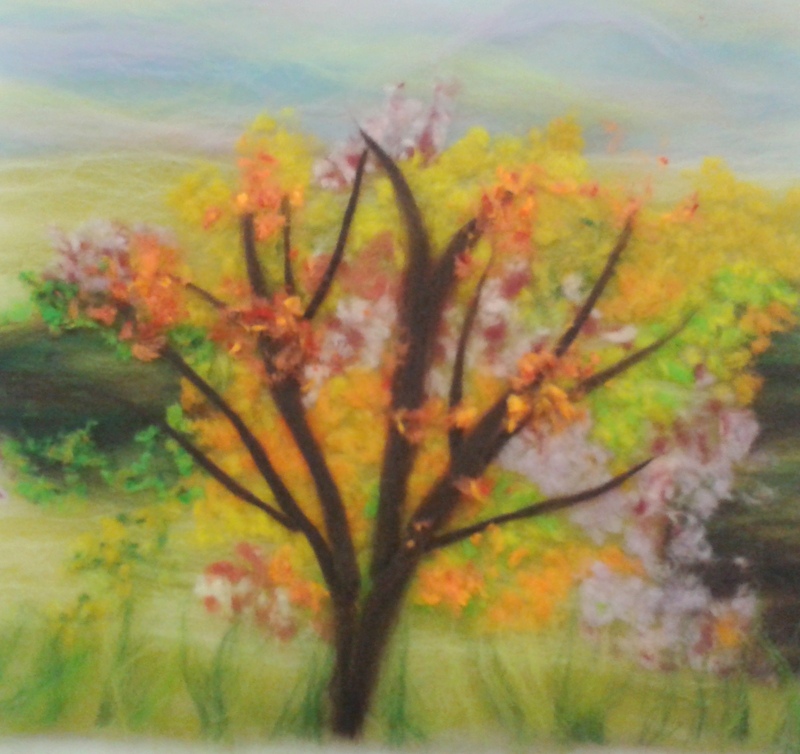 The theme for our wall hanging was ” All things bright and beautiful”. The children designed a picture themselves, then they helped us to recreate it using wool and other fibres. They had so much fun while making it felt- rubbing and rolling it, wetting and adding soap to it. At the end they made a big roll and were shrinking it by rolling with their feet and arms. They really enjoyed the day and all together with joint efforts we managed to raise £1869.15 for different charities. 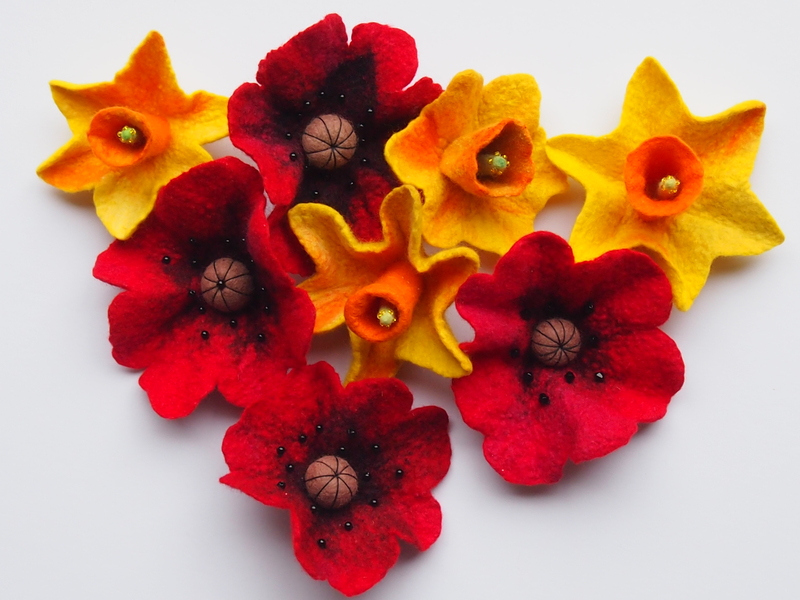 Design and make beautiful felted gifts- a wall hanging , a felted flower and a felt necklace. 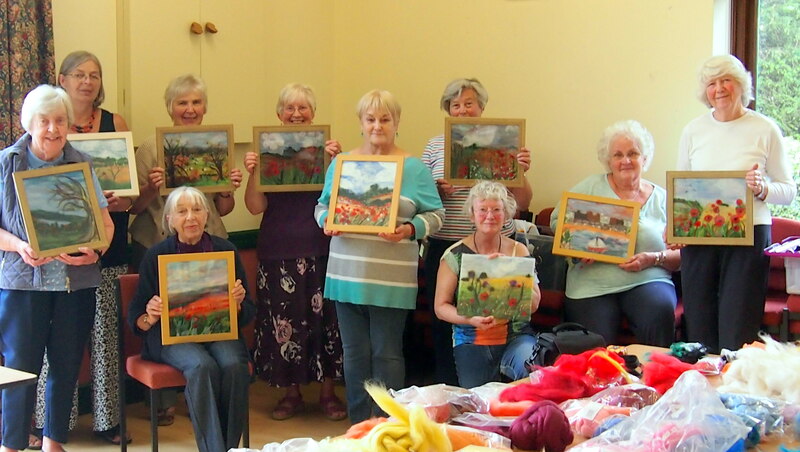 ” Fields with red poppies ” wool painting workshop at Birmingham School of Sewing. Book before 30th of April and get 10% off. 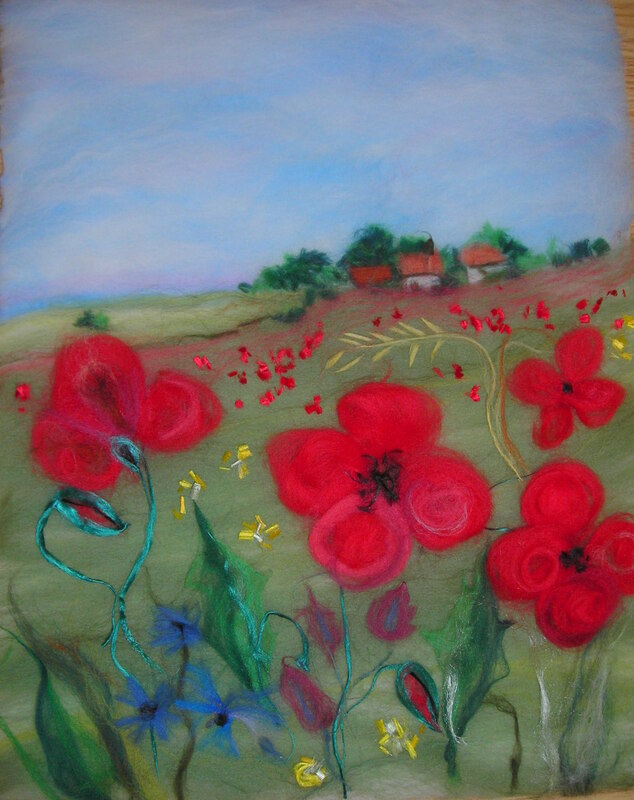 Saturday 20th June “Fields with Red Poppies” wool painting workshop. Magic Wool Studio is taking part in Fashion, Embroidery and Stitch Show at NEC 19-22 March. We will exhibit our new products and give some wool painting demonstrations. I hope to see many of you at the show. Sunday Wool painting club welcomed children last Sunday. The girls really enjoyed learning wool painting techniques and created lovely fibre pictures. Well done, girls! 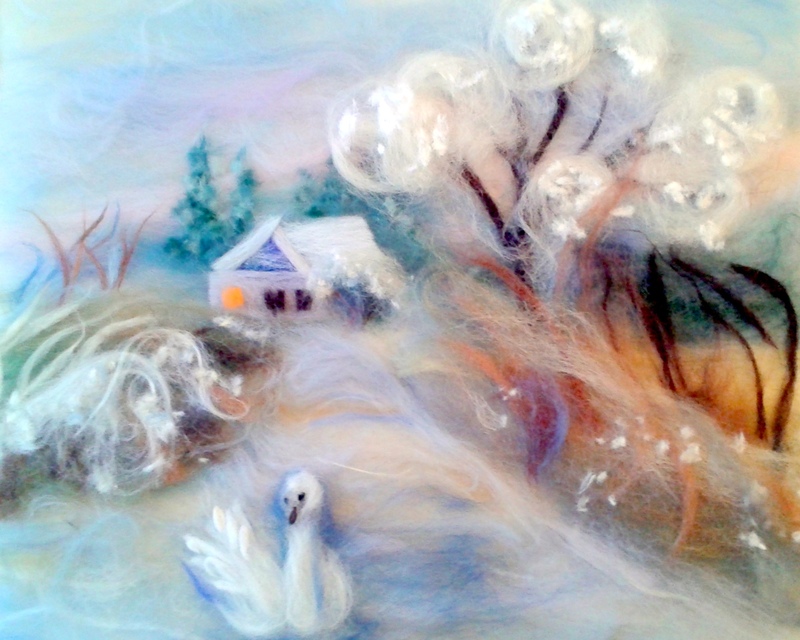 I am doing a free demonstration on how to use Merino felting wool, various yarns, threads and fibres in felt making at Woolwise shop in Kidderminster. Come around and find out how to make a table runner using all the above materials. Learn how to enhance your work with lovely textures, crochet and knitting as well get many creative ideas on how to make unique Christmas presents. Woolwise shop has got a fantastic range of yarns and threads. 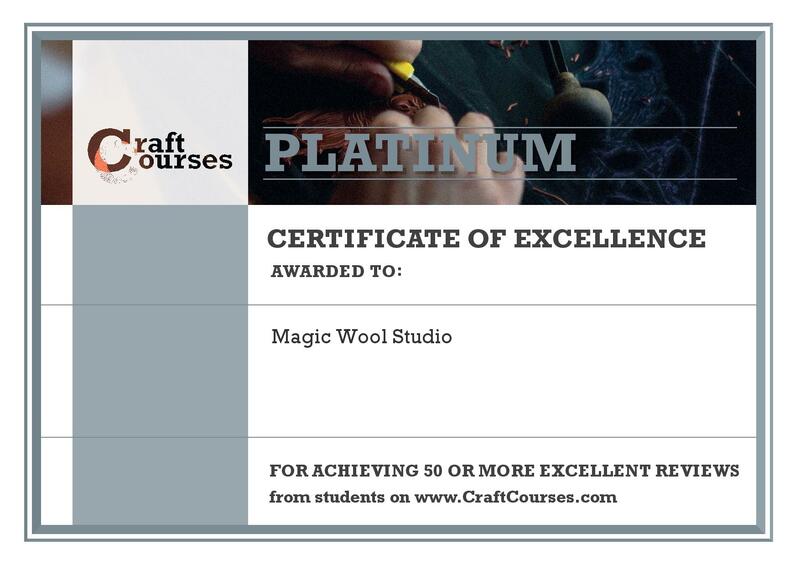 If you like knitting, crochet, felting or looking for some creative ideas the Woolwise is just the place you need. It is a treasure chest for art and craft people. I love this shop! Wool painting Sunday club has been very popular. The Ladies make some fantastic work and enjoy socializing and exchanging new ideas. They learn many wool painting techniques and secrets. 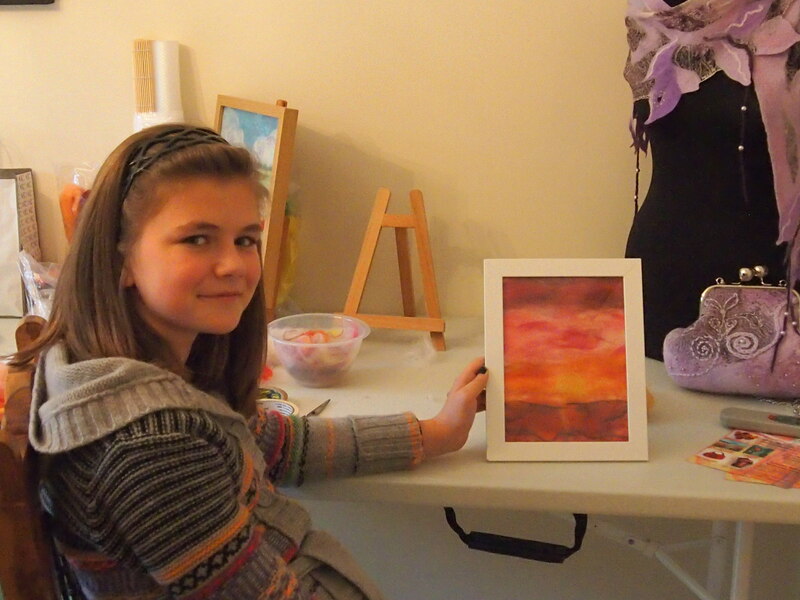 Julia’s daughter loved her mother’s work and decided to join our wool painting classes. Inga is an absolute beginner. 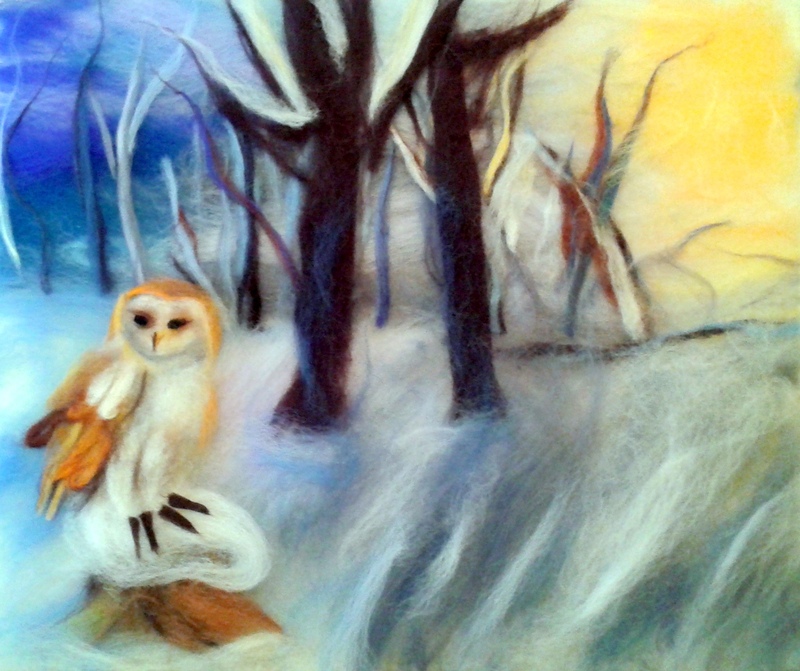 She created a beautiful picture of a fluffy cat with felting wool and other fibres at our studio last Sunday. 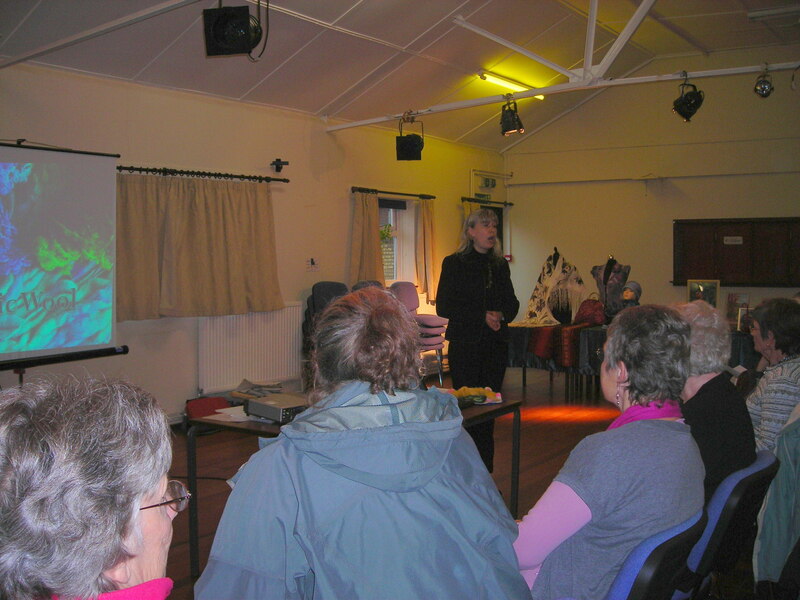 The ladies really enjoyed the Talk and demonstration on Wet Felting at Clows Top Victory hall in Worcestershire which took place on 6th of October. These are some photos of the event. Everyone is welcome! No experience in Textiles or Art is necessary! 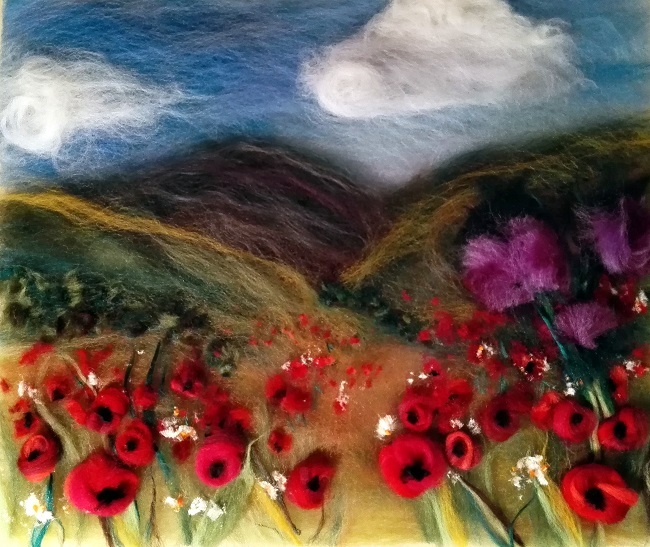 In this course you will learn history of felt making as well as needle felting and traditional felting techniques and processes. 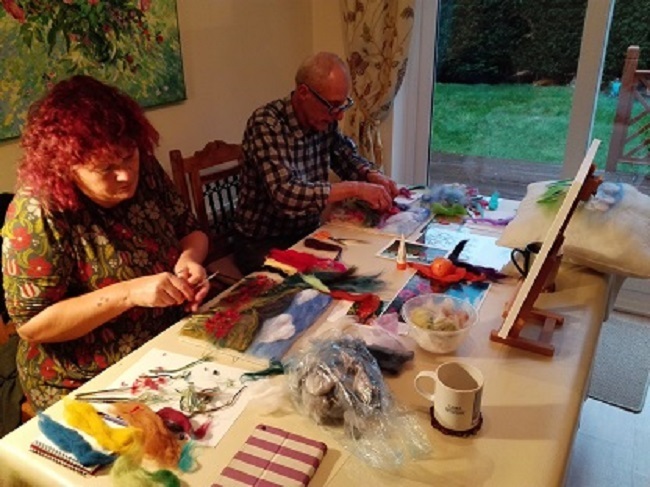 You will find out how to felt, what materials and tools to use for making felt and will experiment with various textures, fibres and colours and design your own felt items. During these classes you will make a flower brooch, a bracelet/bangle, earrings, a necklace and a Mobile phone case. Come along and join us for these fun workshops. Relax and enjoy being creative. Tea, coffee and biscuits are provided all through the day. Every Sunday our studio is open between 11am and 3pm for anyone to drop in at our Wool painting Club. Please, call us first to check the availability as these sessions fill up fast. This is a fantastic opportunity for you to spend a few hours on a Sunday socializing with like-minded creative people and learning a new skill. This is a great chance to unwind with a cup tea/coffee and a cake and enjoy making a wool painting. 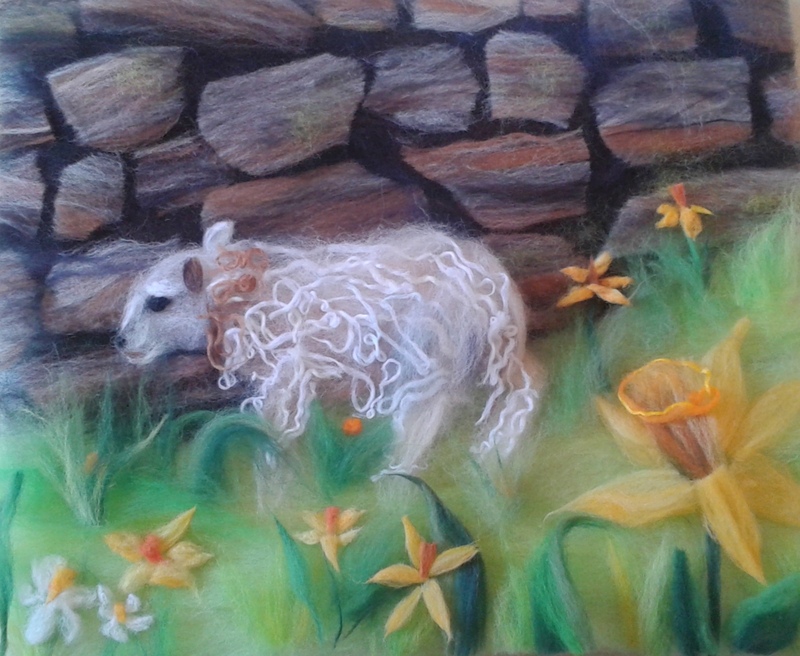 If you would like to create a wool painting for yourself or for a special friend and do not know where to start come along and our experienced teacher will help you to get started and will be there when you get stuck. 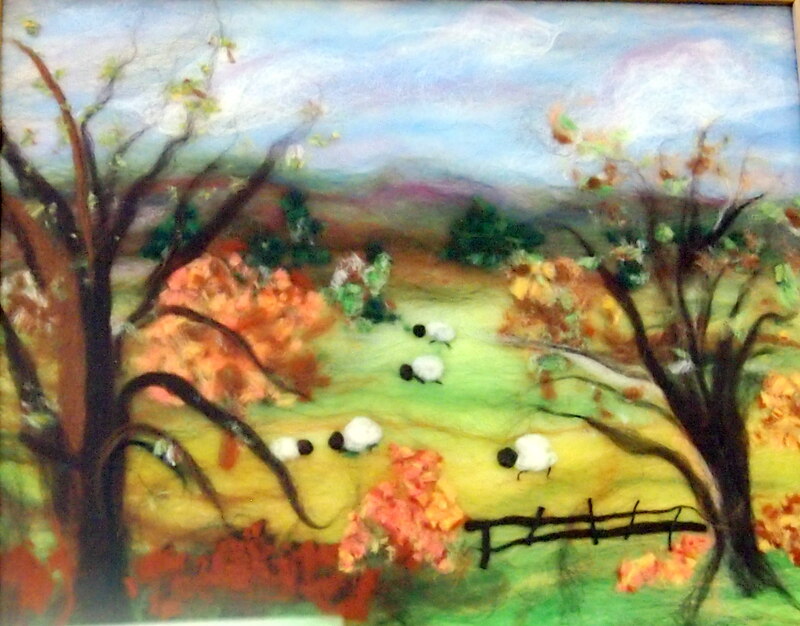 Do not worry if you are not an artist and you have never made a wool painting before. 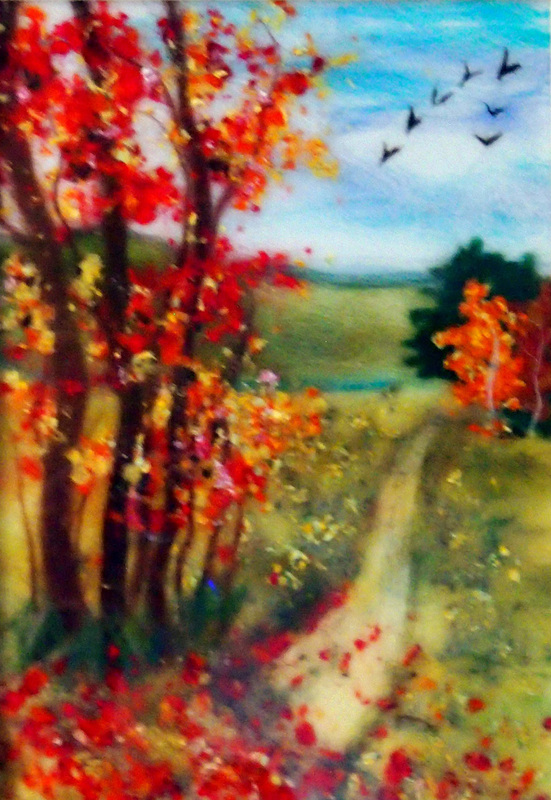 You will be guided through the processes of creating a picture and shown many wool painting techniques. Bring a picture or a photo which you would like to recreate using wool fibres or simply use one of our pictures to work from. 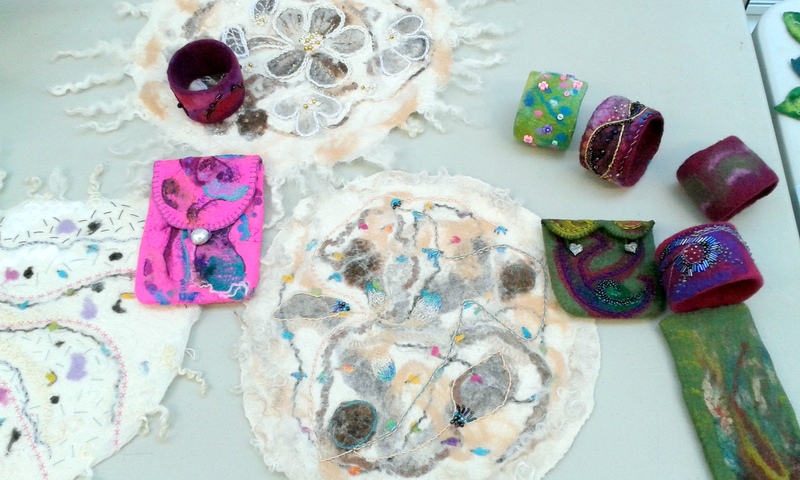 “Magic Wool” talk and Felt Jewellery workshop at East Yorkshire Embroidery Society 8th and 9th of February 2014 in Cottingham. I have just given a talk and run a workshop for E.Y.E.S. (East Yorkshire Embroidery Society). What an amazing group of people!! I have never met so many friendly, enthusiastic and inspiring people! There are about 160 members in the E. Y. E.S. who meet regularly to learn new skills, visit exhibitions and listen to lectures by artists and craftsmen. My lecture called “Magic Wool” was very well received and many people made positive comments about the work that I displayed at the Darby and Joan Hall. 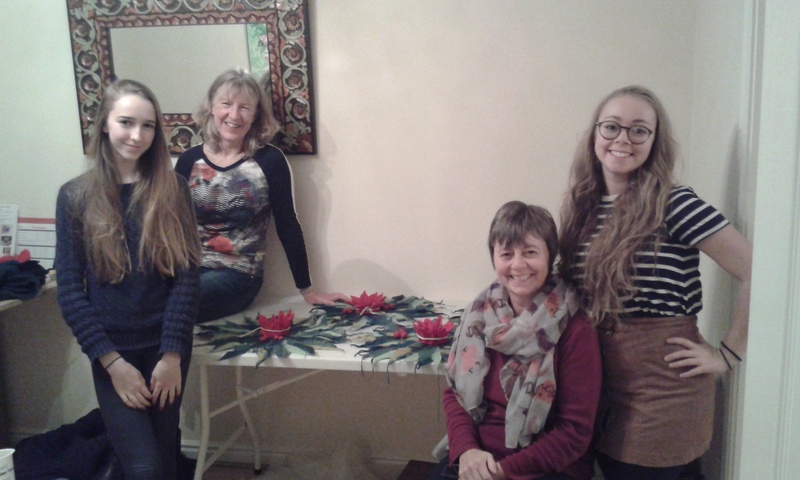 On Sunday 9th of February I ran Felt Jewellery Workshop for 19 people.The ladies enjoyed it very much and made some beautiful flowers and beads. These are some photos of the workshop which I would like to share with you. I would like to thank everybody from E.Y.E.S. for making me feel so welcome and all the help and support that I received. This is some lovely work that the ladies produced.